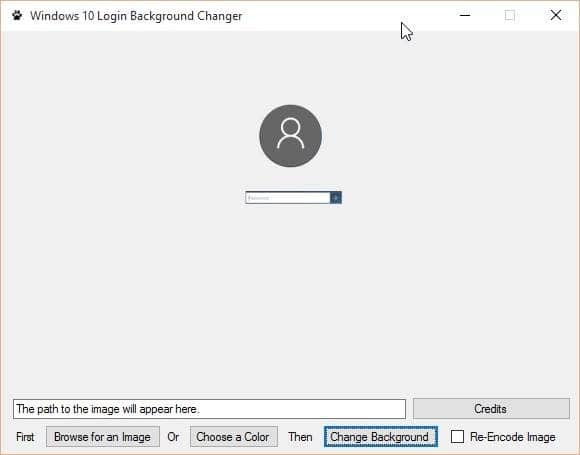 In one of our previous guides titled how to change Windows 10 login screen background image, we talked about a workaround to change the default background picture of the login or logon screen in Windows 10. As mentioned in the workaround article, the default login screen picture is stored in Windows.logon.ui.pri file located under SystemResources directory (Windows\SystemResources). To change the background picture of login screen in Windows 10, we need to create a new .pri file by including the custom background image and then replace the original .pri file with the custom one by taking ownership of the file and folder where original Windows.logon.ui.pri file is located. The guide to change Windows 10 login screen works great but is not for everyone. In fact, most users find it difficult to take ownership of files and prefer using a software for the job. For all those users who would like to change Windows 10 login screen without manually touching original system files, here is a free utility for the job by Krutonium at MDL forums. 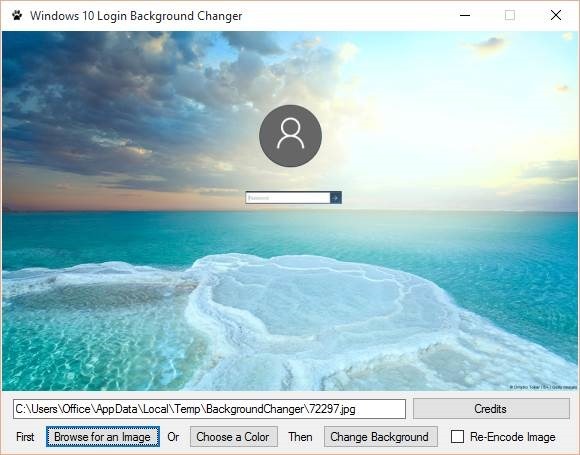 Windows 10 Login Background Changer is a free application designed to easily change the default login screen background image in Windows 10. With Windows 10 Login Background Changer, you can set your own picture as login screen background with a few mouse clicks. This tool is based on the previously mentioned workaround but makes changing login screen background dead easy. The tool supports both 32-bit and 64-bit Windows 10. Here is how to use Windows 10 Login Background Changer to change Windows 10 login screen background picture. WARNING: This tool edits or replaces one or more original system files. We recommend you create a system restore point before running the tool just in case if anything goes wrong. The software is still in its stage, use this at your own risk. We are not responsible for any damage it might cause to your files or Windows 10! Step 1: Download Windows 10 Login Background Changer tool. Step 2: Right-click on the exe file, click Run as administrator. Step 3: Now, click the Browse button to select the picture that you want to set as login screen background. Step 4: Finally, click Change Background button to change the login screen background. That’s it! As you can see in the above picture, the tool also lets you set a solid color as login screen background instead of a picture. Sign out or use Windows + L shortcut keys and press Enter key to see the new login screen background. How was your experience with Windows 10 Login Screen Changer? Excelente. Para los que tengan la entrada ” DisableLogonBackgroundImage ” en ” 1 ” tienen que cambiar el valor a ” 0 “. Saludos y muchas gracias por solucionar mi problema. it does not work. For when an update? It worked 2 months ago. Now it says a severe error occurred and to wait for an update. Please help, as this is the coolest app on the planet. For Windows 10. Thank you!!! I also face like that , so please show me the way how to fix it . Right after I click on the change background, my computer hanged,. I try to sign out but I only see a black screen with a cursor on it. I tried also turn off and on my computer so many times and yet the issue still persists. ? Right now, I’m trying to go back to its previous built. Sorry it didn’t work out in my case. After I made the process my computer does not start, gets a black screen when you turn on, what do I do? Right after I click on the change background, my computer hanged,. I try to sign out but I only see a black screen with a cursor on it. I tried also turn off and on my computer so many times and yet the issue still persists. :( Right now, I’m trying to go back to its previous built. Sorry it didn’t work out in my case. The “Next Option” is available in menu-But what happened to “Previous Option”, in the menu, for desktop wallpaper? I really would like to see this option included in upcoming updates. Or even a hot fix, or the ability to add the option myself (with the proper direction of course). Would even be satisfied with a third party fix-if one is available. Hello, the download link is no longer there.. is says something about dropbox? I’ve never used it ever… HELP!